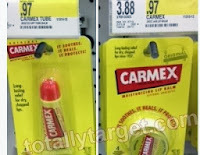 Head over to your nearest Target to get Carmex Lip Balm for $0.47! $0.94 for two (2) or $0.47 a piece after coupon! Or you can always hold on to the coupon and wait until there is a sale. It has a long expiration date! remember you can print this twice.